Uber launched in Australia 2 years ago, in October 2012. If you haven’t heard of it, here’s a quick recap. Uber is a car ride-sharing service backed by Google – it allows you use its app to catch a ride from one of its drivers. Just about anyone with a car can be a driver – not just taxis, but also serviced cars and even ordinary people (like this). The benefit for the average person is simple. Because drivers don’t need to pay for expensive taxi licenses, Uber rides are generally cheaper than taxis (or so they claim). For taxi drivers, they get the benefit of additional jobs, when they used to just wait at the rank. However, the taxi industry has been at logger-heads with Uber entering the market. Taxi drivers protested against the service in Perth and the Government is cracking down on Uber’s drivers in Adelaide, NSW and Victoria. Many critics cite the security concerns when anyone and any car can transport the public. Despite similar critics in the US and in Europe, the consumer reaction has been overwhelmingly the opposite. When taxi drivers went on strike in London, Uber saw an 850% jump in sign-ups. Globally, Uber’s CEO says that they are doubling revenue every six months. So given our local industry reaction, we wanted to see how ordinary Australians are reacting. First, we looked at Uber’s market share by the number of people that spent on its services vs paying for taxis electronically, from its official launch in October 2012 to December 2014. As you can see, the rise has been quite spectacular over the last calendar year. A few important dates to keep in mind. Uber first launched as UberBlack, with only a fleet of black cars which chauffeured users around. This was able to soak up around 3% of the total market pie. And then in June 2013, Uber launched UberTaxi – the service which allows taxis to become Uber cars. This then soaked up a further 2% – totalling a 5% share of the electronic payments market. From January 2014 however, Uber ramped up it’s marketing efforts (see picture of price comparison table from their Feb 2014 email). UberX – their much criticised peer-to-peer service launched in March 2014, contributing to what now seems like a consistent trend of month-on-month growth, capturing 22% of electronic taxi payments in December 2014. Stats submitted from payments provider Cabfare suggests that cash payments in taxis make up around 60% of total spending on taxi fares. This means electronic payments make up around 40%. Our data looks at Uber’s share of fares that are paid electronically. Based on our 22% number, we project their total share of Australian taxi spending to be around 8.8% – making it roughly 1 Uber dollar spent for every 12 taxi dollars spent in December 2014. Huge progress, for a business that didn’t exist 2 years ago. Another interesting finding is when we look at the average spending on taxis vs Uber. The average spend per journey with taxis has kept steady over the years, while the amount spent per Uber ride has significantly reduced, and is reducing over time. The drop happened in April 2014, the same time Uber introduced UberX in Australia, and has continued to drop as UberX gets more popular. As Uber become more ubiquitous, users are hailing rides for ever shorter trips. 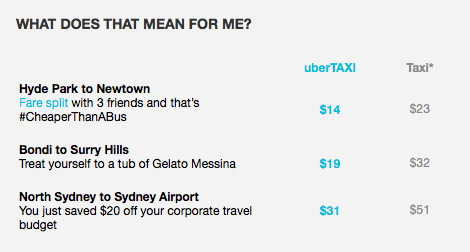 One thing to note here is that the average spending of taxis in our sample is about $30. 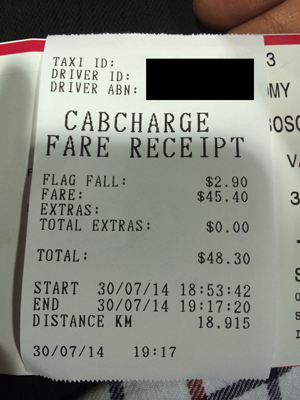 The average spending that Australian Taxi Industry Association (ATIA) reports is $22.76. One plausible explanation for this discrepancy is that the ATIA’s number includes cash transactions, which we assume tends to be smaller than the average amount paid through electronic card transactions. 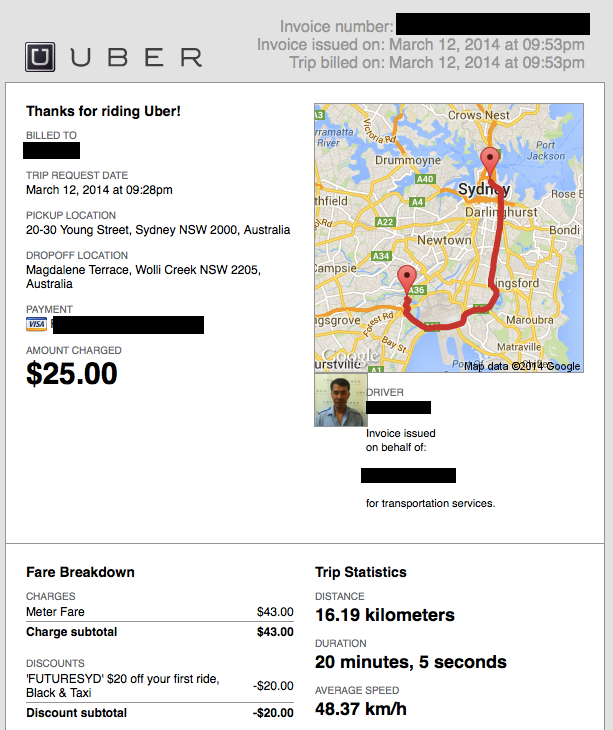 During December 2014, Uber was criticised heavily for surge pricing during the Sydney Martin Place siege event. Whilst surge pricing works to incentivise and increase supply of drivers during busy periods, the untimeliness caused significant criticism. 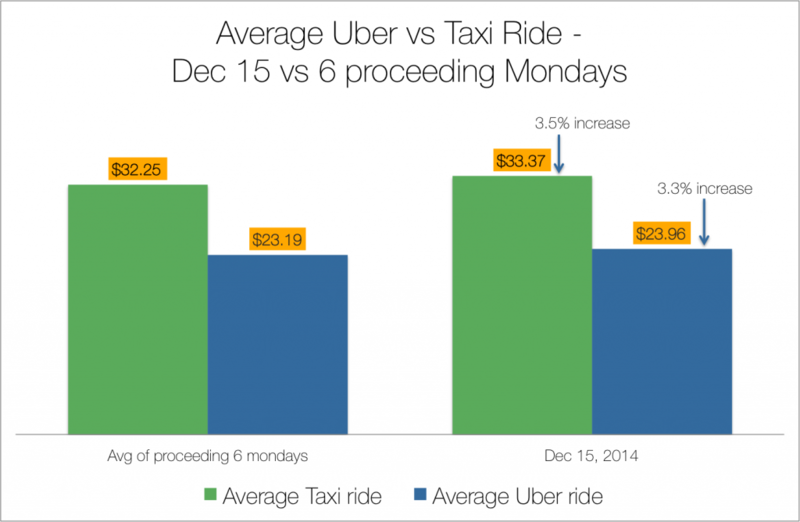 We looked at spending on taxis and Uber on December 15, 2014. The first day of the hostage crisis. Contrary to media expectations, the price of average Uber rides for the 15th, did not exceed the increase for taxis in Sydney overall. It was in fact 0.2% less. i.e. people that normally wouldn’t be taking a cab home (live further out) were and this led to a small increase in average ride spend. The size of this increase was about the same for both taxis and Uber. So it appears users were not affected by surge pricing at the end of the day . It is difficult to imagine similar trends won’t continue in the months and years ahead. On the users side, clear pricing, convenience, superior and cleaner cars (allegedly), and anecdotally cheaper prices (our data supports it) will continue to make the service super compelling. Furthermore, this is the receipt experience. You be the judge. In San Francisco, where Uber was founded and first launched, the Municipal Transportation agency reported that the average trips per taxi has tumbled by 65%. The suspected cause – the rise of ride-sharing apps like Uber. If that’s true, then that makes “catching an Uber” more popular than “catching a taxi” in San Francisco. Certainly, some of the lingo like “Uber it” has already come to our shores via popular US tv shows. It’s hard to imagine that won’t be Sydney in a year or two. 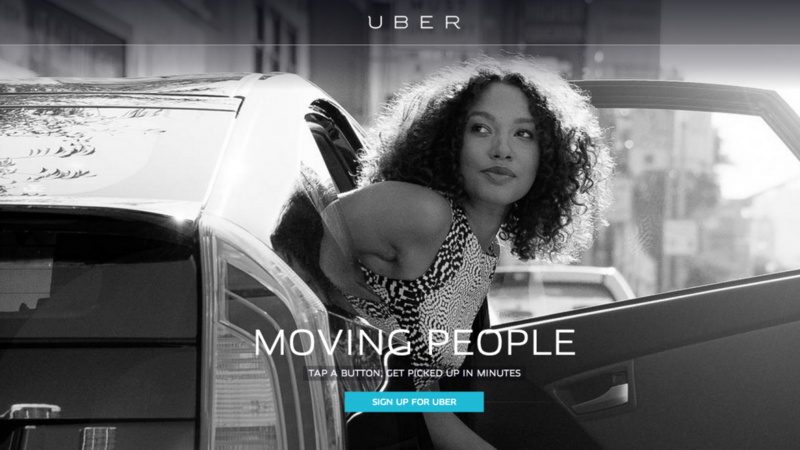 Are Uber customers switching away from taxis, or were they never taxi commuters anyway? How many times do taxi commuters take rides and how does Uber compare? What will the be impact of Uber’s growth on the value of taxi licences? Our data comes from the real-spending of Pocketbook users, with all data de-identified, aggregated and analysed internally to protect security and privacy of our users data. The data is not from a survey. The data is not from Uber or any taxi related industry group, unless it is referenced (ie AITA). The surge pricing analysis didn’t include any free rides, or cashbacks which Uber ended up providing, which would have incorrectly reduced the average.